Our manuscript, entitled “Translating research finding to promote peace: Moving from “field to forum” with verbatim theatre” began years ago when I began working with Japanese researchers. The research side of this story has merged with the creative arts side of the story to present With Their Voices Raised, which was first performed in November 2012. The Playwright/Dramaturg note and the Researcher note were in the program for the inaugural performances in 2012. They are included here to provide a context for understanding the origins of the manuscript. The performance that we will watch tonight has its roots in research that began nearly two decades ago when Japanese and American researchers were studying blood pressure changes while talking to Japanese elders who had suffered a stroke. Our study purpose was to understand how the pathophysiology of stroke affected blood pressure recorded during talking. We asked our research participants to talk for four minute about their health; how they were managing the limitations imposed by their stroke…while we recorded blood pressure every two minutes. Our participants took us down an unexpected path. The stories they shared while speaking wove in how they survived World War II, with the implicit and sometimes explicit suggestion that surviving a stroke was “nothing” compared to their World War II experience. As the research team considered what we were hearing, we decided that we needed to know more about surviving WWII for both Japanese and American elders. The bombings of Pearl Harbor and Hiroshima were selected as points of comparison, where each participant would be called upon to recollect aggressive actions taken by the opposing country. About the same time the research was launched, we knew that we wanted to share these findings in ways other than traditional scholarly venues, like scientific journals. We wanted to touch people who may never read a scientific journal; wanted to reach youth who may be experiencing aggression in their own lives. We have published our research findings in a scholarly journal. Now….tonight, you are joining our journey as With Their Voices Raised shares the wisdom of our participants through documentary theatre. With your guidance, we will move on to share this wisdom with young people. We thank you for being here. understanding of the events leading to United States involvement in World War II. My knowledge of the Pacific theater was based upon a recollection of a grainy photograph in my American History high-school text book of the U.S. Arizona engulfed in smoke and flames at Pearl Harbor on Dec 7, 1941. I had also read Hiroshima by John Hersey, but had no connection with the term hibakusha. I had a lot to learn. In the winter of 2011 I traveled to Hiroshima, Japan and had my picture taken underneath the Memorial Monument for Hiroshima. Inside the Peace Museum I noticed a pocket watch, forever stopped at 8:15, tattered swatches of blackened clothing, and tiny pieces of concrete that were once buildings and homes. I watched video footage of the atomic bomb, its mushroom cloud of ash and debris rising high into the morning sky. I saw archaic clips of bald hibakusha, their faces covered with red dots, their teeth black and decaying. Finally, I signed the visitor’s book, along with countless others, in a pledge and plea for peace throughout the world. In the spring of 2012 I visited Oahu, Hawaii. I climbed the steps of the control tower at the Pacific Aviation Museum on Ford Island and listened to the silence of the salt air. I rode a ferry over to the USS Arizona and saw the oil-slick ‘tears’ on top of the water while the ship’s turrets remained below. I took the “Home of the Brave” bus tour and drove past the countless headstones at Punchbowl National Cemetery, all decorated with an American flag. Finally, I signed the visitor’s book, along with countless others, thanking our brave servicemen and women for their sacrifice and service to our country. 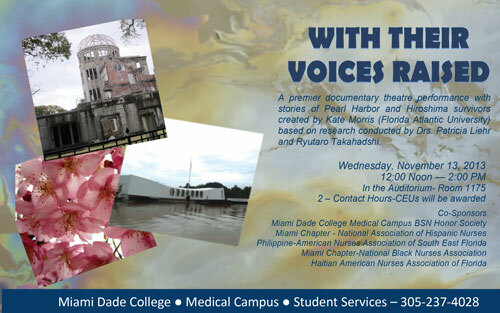 Needless to say, working with the Pearl Harbor and Hiroshima survivors’ stories opened up a whole new path to my studies and the way I viewed the world. It also introduced me to documentary or verbatim theatre as a way to disseminate history and perpetuate research outside the textbook and classroom. By presenting With Their Voices Raised it is my hope that together we may learn by listening, by sharing, and by thoughtfully exploring our cultural differences and similarities in the hopes of a more peaceful future for us all. With that thought in mind, I welcome any comments or questions you may have in the talk-back following the performance and written in the survey. Hibakusha – A-bomb survivor. One who was subjected/exposed to the bomb/radiation. Our next efforts will be directed to taking the script to high school students who will assume the roles of the 8 actors, perform the play, and engage with classmates in a discussion of the meaning of living through aggression. With this research-based creative experience, young people will have a history lesson as well as a lesson about the human spirit that calls for peace. To download your copy of this article while it is featured, visit our ANS web site now! Watch the video clip here! Liehr: Promoting Peace with Verbatim Theater from Peggy L Chinn on Vimeo. ← ANS Issue “Peace & Health” just released! We are so pleased to have this manuscript published in ANS. This work itself has always led us to the next phase through what we were learning in the process. Now I am on my way to Hawaii for a presentation about the nurses who served at Pearl Harbor on December 7, 1941…for the 7th Annual Distinctive Women in Hawaiian History Program. In preparing for this presentation, I have immersed myself in an historical dimension of the work that is yet another learning experience. The history of the nurses has reaffirmed my appreciation for the critical importance of understanding as a peace-promoting endeavor. 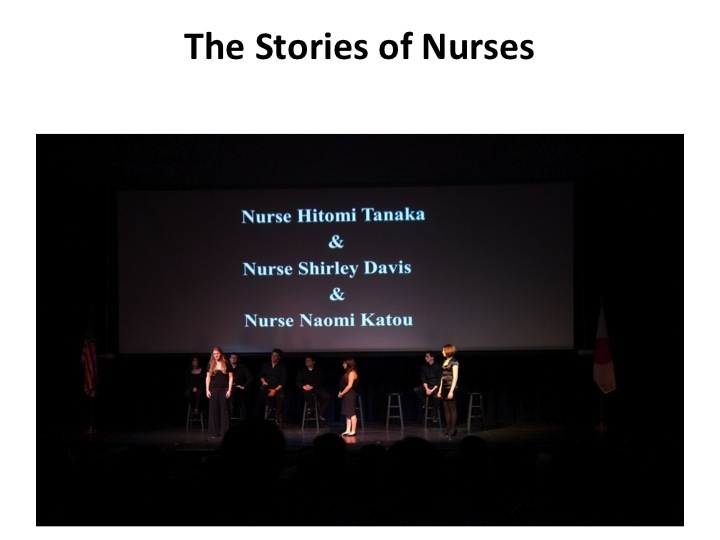 Although years and miles apart, the nurses of Pearl Harbor and Hiroshima rose to unexpected achievement that was a reflection of their love of nursing and their commitment to their patients. I will specifically be talking about Anna Urda Busby, Monica Conter Benning and Annie Gayton Fox. Annie Gayton Fox was the first woman to receive a Purple Heart….and then, a Bronze star for her nursing practice at Pearl Harbor. I hope to have a chance to “talk” with those of you who join this blog conversation. Distinctive Women Conference was a wonderful gathering. Really put spot light on distinctive women and what they experienced WWII, and we had great performances filled with Aloha spirits. Here’s a link to Dr.Liehr’s interview with Mr. Chris Vandercook for Hawaii Public Radio. It touches every nurse’s heart. I am pleased to see that research is delving into more common forms of media. To reach a broader audience other than nurses that subscribe to the journals. It will reach all walks of life and generations. It can also be translated into many different languages with the click of a button. The blog will allow people to share it with friends via social media. The video and future videos made of the performance will allow people that went to the show to share with friends. In the years past attends could only try to relate or relive it for friends now you can share the full experience. The performance and the words of the survivors are both powerful and thought provoking. It does something amazing when something you once read about in history class to come to life. The fact that they want to spare the current and future generations the pain speaks to giant burden they carry. It speaks to the long-term effects of wars and battles. It can also be used as a model to address other past/current tragedies. It is profound that this was all started with a blood pressure and the question of what can cause it to rise. I hope that more research is done in a way that it reaches a wider audience. Good luck in November. I really think that was a brilliant idea to bring two nations who were hurt deeply in the past to make peace through communication using “verbatim theatre”. I never really see it that way, but I agree with Kerridge and colleagues indicating that ” Peace is Fundamental to Health”. When watching a “live performance”, one can actually connects at different levels with what is happening in the story of that play. It feels more real than reading it in a book and the message of that story last longer in one’s memory. In my opinion, this play can really bring awareness to many people and hopefully peace. I applaud the work of everyone who contribute to make it happen and I would like to thank Dr Liehr for giving me the opportunity to read one of her wonderful work. What a great forum for not only education, but for healing of the soul; and who better of a group of people to be implementing the verbatim theatre than nurses. It seems very obvious that when there is no peace, there is no health. This is evident in Syria today. What seems to be very clear when it comes to With Their Voices Raised, this is a way to work through a type of post traumatic stress that the nurses and bombing survivors have faced for over 70 years; and bring peach not only within, but to the future generations. This is an unusual forum for nursing research, but if the lay public does not read the important research, what is the point of doing it in the first place. Perhaps this forum puts scientific jargon in a language that most people can understand; the language of artistic freedom. History can tend to be one-sided, but when it comes to humans, each story has two sides. This forum not only educates the public from a two-sided perspective, but it makes audiences excited to not only learn from the past, but want to change the future.” Perhaps this forum may appear to be political in nature, but was it not politics and the desire for power that caused the bombings from each side in the first place? The article states that this form is “building bridges across misunderstandings.” Bridges are strong and carry the weight of many. As nurses, we are educators and I give kudos to those that were involved in this research project. Humans are caring beings by nature and this forum indeed gives all involved a chance to be cared for as well as to be caring at the same time. The stories are so moving. Perhaps with this artistic forum, healing can finally begin after all these years as bridges are built between the generations. I must say that Dr.Lier did a great job by writing this article. Not only it is important to have peace throughout the world for the future generation, but it is primordial for the health of all our people living on earth. I believe that too many people and specially the young generation don’t know much about WWII. They learned from school or read books about wars that are assigned to them and forget about it. Many people don’t have the opportunity to visit places like Pearl Harbor or Hiroshima, Auschwitz, and many other places in Europe and by bringing the play to them, the audience can connect with the history of wars and make a difference in the world. I think that this was a fabulous idea to create a play that brings a tale of two nations together. To think that this all started with research on blood pressure changes is unbelievable. Many people usually never hear the stories of the survivors and to read it in a book is one thing, but to watch it unfold in front of your eyes is amazing. The audience feels the emotions of what the survivors felt. It will leave a lasting impression and allow an individual to connect and feel the pain of the survivors. As i watched the short clip, I felt inspired to do good and hope for peace in the world. I am looking forward to watch the entire play on November 13. There are many lessons to be learned from this inspirational play that are applicable today. Globalization comes to mind as the historical aspects brought about change in the global market, healthcare, and education. In addition, cultural awareness of the Japanese and American people through this research based dramatization will enhance understanding of these events in a very unique way. With all of the talk of war with Syria in the national news, this post is right on time! The message is very emotional and uplifting. Thank you for sharing! Dear JBS….on this day, September 11, I want to take a moment to thank you for this posting that called attention to the timeliness of the the message in the manuscript. I have a sense of “telescoping time” and I am reminded that history lives in the decisions that we make today. Now….I am remembering those who lost their lives on 9/11….and I am affirming my conviction that there is no peace without understanding…….and yet……sometimes, like today, it feels as though it is impossible to understand. I think that this is an amazing way to spread and share history and bridge the gap between two cultures/countries. I was born and raised in the Philippines, a country that also have a war history with Japan. I used to hear horror stories from my grandparents who experienced it first hand. You could tell by their voices that the pain and hatred is still there after all these years. History is something you can’t undo but something that you can definitely learn from. That being said, we can’t go back only forward and make changes to ensure that this does not happen again. I just hope that people in the Philippines that still have that pain and hatred can find a way to bridge the gap as well. I would love to see the performance. April, I think you call attention to how the effects of history remain alive today…it is an important idea and I think nurses are called to consider how we can promote peace through understanding. Thank you for your message and thanks to all the students who have taken the time to read the manuscript and share their thoughts on the blog. Hatred is such a strong word that brings darkness to the soul. I found the comment that Patricia made about promoting peace through understanding so important. As a nurse educator, the art of nursing is something that I feel very strongly about. The beauty of nursing is that it combines my love of both art and science. So many new nurses and students are driven by the tasks that they fail to see how important comfort, cultural considerations, therapeutic communication, and respect are to those we care for. There is much to learn from the past.